When routes are safe, walking and biking to school are fun, easy, and inexpensive ways for students to get some of the daily physical activity they need to stay in good health. Safe Routes to School (SRTS) initiatives also help to unite neighborhoods, ease traffic jams and air pollution, and contribute to students’ readiness to learn in school. Studies have shown that physically active kids exhibit improved mood and concentration, stronger self image, and more self confidence. Physically active kids also have fewer chronic health problems and report lower levels of smoking and alcohol consumption. Most of today’s parents walked or biked to school when they were young; they explored their neighborhoods regularly on bike or on foot. Things are much different today. Today’s children are driven to nearly all their activities, and only about 10 percent of children walk to school. There are several reasons for this sharp decline, and the SRTS grant planning process is here to help communities identify and overcome these barriers. One of the cornerstones of SRTS is the acknowledgement that safer walking and biking routes can best be accomplished through a combination of infrastructure and non-infrastructure initiatives. An event celebrated nationwide in October, Walk to School Day encourages walkable communities, physical fitness, and healthy habits in young students across Michigan. 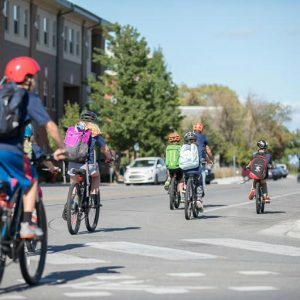 Bike to School Day is a global initiative aimed at bringing students, parents, community leaders, and other stakeholders together to build awareness for communities to be healthy, walkable, and bikeable.